Giving the opposition response to the State Of The Union address is hard. You have to attack or at the very least contrast the President by dishing similar rhetoric. But when the President delivers in this forum, he gets standing ovations and backslaps from both sides. The response has no audience and no pause, it's just one person in a stale environment looking directly into the camera for 14 or so minutes - Or in Michele Bachmann's case, looking away from it. Call it executive privilege I guess. 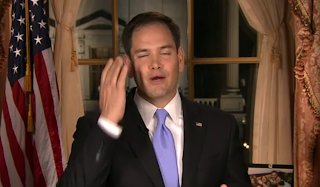 Marco Rubio's response was more eloquent than Bobby Jindal or Paul Ryan before him, though he became fidgety and mushy-mouthed about 5 minutes in. When you have an audience, you can stop to wipe your brow or get a drink of water after an applause line. There is no such luxury in this role. And unfortunately, the substance (I know that's a stretch) of Rubio's speech was lost as millions at home recognized how unnerved he was. Time Magazine may have anointed him as "The Republican Savior," but last night he was just another political pawn, one that is sacrificed in the big chess game. Since the clip of a shifty (see what I did there?) Rubio reaching for his bottled water will be on a loop for the next four years, Backtime proudly re-airs its much more comprehensive dossier on Senator Rubio from this past fall. 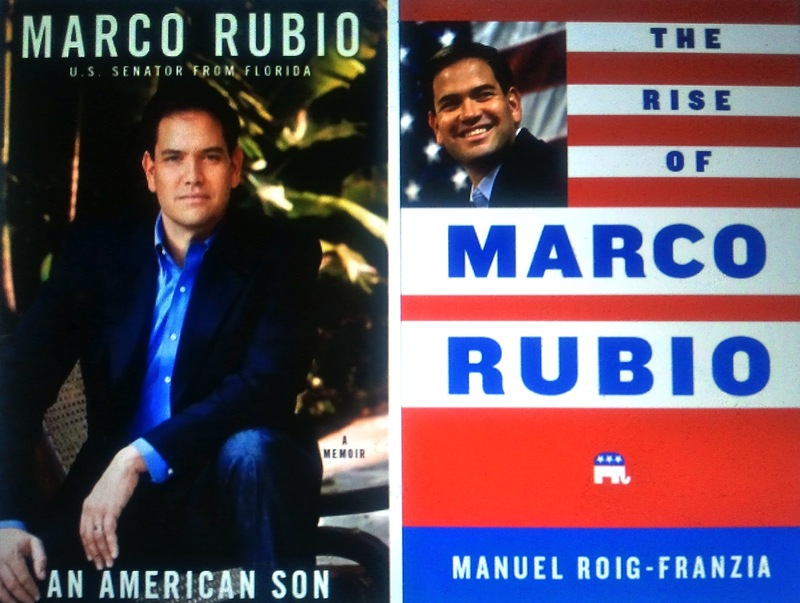 On June 19th of this year, two dueling Marco Rubio biographies were released on the same day. On the left American Son, the memoir/autobiography of the Florida Senator and conservative rock star. On the right The Rise Of Marco Rubio, the unauthorized biography by Washington Post writer Manuel Roig-Franzia. Which one do you think I read? Roig-Franzia's work is investigative to put it lightly. The text of the book, including afterword is 244 pages. After that, there are 32 pages of source notes. Much of the professional end is kind of boring, unless you like the hero's ascension through local and state politics. But as Rubio's life story is peeled back layer-by-layer, you can see why he wasn't the VP pick. Would Rubio have helped Romney's chances? Maybe. Would he have dragged more drama into a ticket already riddled with soap opera? Absolutely. Not that anything necessarily disqualifies Rubio from the job. But the national vetting process would've caught wildfire with all the issues the book details, especially in a 3-month sprint to the finish. Rubio's story, which is uniquely American by the way, is better deconstructed over the long haul. He could announce in 2015 and let the media and his GOP opponents have at it. What would be massive distractions to the campaign now would be something he and his strategists could tackle individually over the long haul. 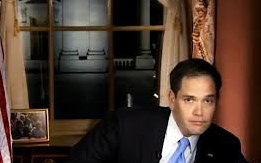 Before chronicling the problems with Marco Rubio's own narrative, it's important to point out that he's not Tea Party. Yes he rode the insurgent wave against the GOP establishment in 2010 as he was a massive underdog to Florida's then-Governor Charlie Crist, and incorporated the movement into a landslide victory. He essentially sent Crist packing to the other side. And Crist's chief strategist, Stuart Stevens, who managed a huge lead into a woeful defeat is doing his unwitting best to unravel Mitt Romney's 2012 campaign. Rubio was the House Speaker in one of the purplest states in the country. While he wasn't a household name, he was a political animal. He got the Tea Party support because Crist infamously hugged President Obama. Godfather Jim DeMint gave the blessing, but once in the Senate Rubio opted not to join Rand Paul's Tea Party Caucus. On the whole Rubio's bio is conservative enough, definitively on social issues and mostly (a converted GOP spender) on financial ones. But he's been moderate-to-progressive on immigration, and had to modify his position several times as the GOP candidates tried to out-reactionary each other in the early 2012 debates. Rubio's mantra is about a family being welcomed in the America, and the land of opportunity made it possible for him to be where he is today. Which is true. Except he wasn't exactly forthcoming with his story's specifics, and it might seem as though it was politicized to raise his profile. Rubio went on the stump and kick-started his web bio as his family was in exile, fleeing from the thug Castro's Cuba. But the real story is that his parents arrived in May of 1956, a good 2 1/2 years before Castro took power. And while it's true that after Castro the Rubio family could not return to their homeland, they were immigrants, not refugees. In fact Rubio's grandfather, Pedro Victor Garcia was a proud man. When he realized that he couldn't find good work in the US and was tired of depending on his seven daughters and their husbands, he returned to Cuba in 1959 to make a better living. If anyone ever scratched their head about what on earth Mitt Romney meant by "self-deportation," this encapsulates it. Garcia actually took a job with the Cuban government (Castro regime) before returning to the US in 1962, attempting to re-enter for good. An immigration judge ordered him deported, but the Cuban Missile Crisis began, and his return to Cuba became logistically impossible though his presence in the US remained illegal for several years until his permanent residency was approved in 1967. The point here is that Cuban-Americans are held politically in higher regard than other Latino immigrants because of their escape from Communist rule. Again it doesn't diminish the Rubio success story, but the circumstances under which the family arrived from Cuba are not political, and not exploitable for political gain. There's more family baggage of note. Rubio's sister's husband, brother-in-law Orlando Cicilia, was convicted on a drug trafficking/money laundering deal in 1987. He didn't seem to be a major player, but it was for a major honcho (think Calderone from Miami Vice). He wound up serving 12 years on a 25-year sentence. How does this affect Marco Rubio, who was roaming in the defensive secondary at South Miami High at the time? Likely not at all. But it became a major dust-up with Univision when they broke the story. Which could be another reason Rubio isn't ready for the national glare, that he reacts hotly and needs time to grow a thicker skin to play the bigger game. Then there are the corrupt types around him. Rubio's very first fundraiser when running for US Senate was thrown by Alan Mendelsohn, a notorious GOP donor, who later was sentenced to four years in prison for bribery, siphoning PAC funds, and failing to report 600K in income. And members of Rubio's inner-circle have also found trouble. State Legislator Ralph Arza faced pressure to resign after using racial slurs more than once. And his itimidation tactics later led to a guilty plea in a witness-tampering case. He got six months. Rubio's other right-hand man David Rivera, is now the US Representative from Florida's 25th district. He has repeatedly been under investigation related to financial disclosures, and possible kickbacks received from gambling proprietors (dog track owners). Despite Rubio's fierce anti-gambling track record (he saw the destruction of lives throughout his years in Vegas), he and Rivera are best buddies. They were even involved in a foreclosure proceeding for a house they co-owned in Tallahassee, which was quickly rectified. But many of Rubio's personal finances are co-mingled with his political ones. There are many situations over the years where his RNC card was used to pay for personal stuff, big and small. Rubio always seemed to work the matters out, but it could be interpreted as he was trying to slide some purchases through. That could be in part due to his own personal financial disclosures, which showed an ongoing debt problem (into low six figures) that could be viewed in direct opposition to the public profile of personal responsibility. In later years, the lucrative sale of property to a campaign contributor also raised some flags. These items from the Florida political landscape are documented matter-of-factly by Roig-Franzia. Corruption and kickbacks are nothing new to the Florida state politics, or would it be to any other state. It's the price of doing business, and Rubio doesn't come across as a criminal or an angel. Rubio's religious history is also a zigzag. He was born Catholic, converted to Mormon when his family moved to Las Vegas in his middle school years, became Catholic again when the family returned to Miami, then went Baptist as an adult while eventually settling on Catholic. His straddling of the line between the different branches of Christianity may also come across as calculated. After all, in order to embrace all of Florida, it would be wise to caucus with the Spanish-speaking Catholics in Miami while simultaneously thumping bibles in the panhandle. Throw in some pandering to rich Jews in Boca (make sure you check for hidden cameras) and you've got the trifecta. What the book doesn't capture is the charismatic figure and captivating speaker that Rubio has become, you'd probably have to read the other book to tap into that. He is championed by republicans up and down the line, and seems respected by democrats as well. His endorsement of Romney was tepid (like many), he's kept a fairly low profile throughout 2012, and looks to be gauging which way the future GOP wind blows, so he can adjust his sail accordingly.